We’re saddened by the loss of life and devastation in the California wildfires. Apple will be donating to relief efforts to help those in need. We thank the brave firefighters working so hard and risking their lives to contain the flames. Apple has started accepting American Red Cross donations as part of the California wildfire relief effort. Donations can easily be made on the web from Apple’s homepage or from the App Store or iTunes Store using the payment method associated with your Apple ID. With the number of refugees now fleeing war-torn Syria reaching into the hundreds of thousands, Apple is inviting customers to donate to the Red Cross through a splash page on the iTunes Store. There are donate buttons for amounts ranging from $5 to $200 in the U.S. store, and for similar sums in other countries. 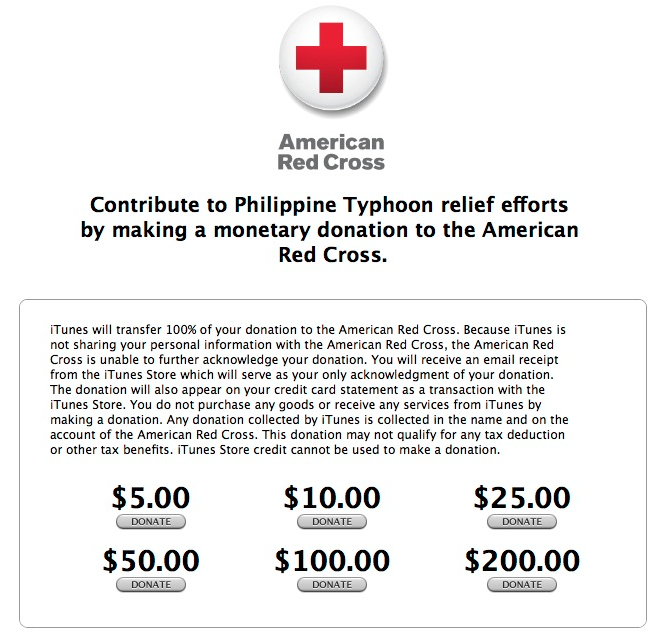 Apple is inviting iTunes customers to donate between $5 and $200 to the American Red Cross to assist its relief work in response to Typhoon Haiyam, which is estimated to have killed more than 10,000 people (update: the estimate was later revised to 2,500). The typhoon – the name given to a hurricane when it occurs in the West Pacific – is thought to have been the worst ever to hit land. Philippine Red Cross volunteer rescue and relief teams are providing assistance in the hardest hit communities, including assisting in search and rescue efforts and distributing food and relief supplies to survivors. Apple has used the iTunes donation system several times, in response to Superstorm Sandy, the tsunami in Japan and the earthquakes in Haiti. Update: As noted by commenters below, you might want avoid this 5.1 update. It appears to have made the app unusable for some. Facebook found the issue and have addressed it server side. It should be working fine as of 30 minutes ago.